Building a Custom Home or building a home addition is a great experience, however they comes with their share of effort and worry. However, understanding all the aspects associated with building a custom home or building a home addition can help ease your concerns. Contained in the articles below are a myriad of tips and advice, as well as personal experiences, on building custom homes and building home additions. They cover every aspect of home construction – from finding the right building lot, to hiring the right general contractor, to obtaining financing for your home addition or custom home building project, and to designing the right house floorplan to meet your specific needs. Check them out before starting your own home building project. 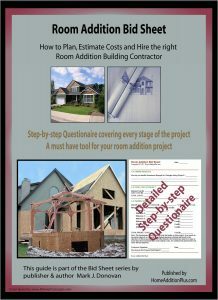 Use this New Custom Home Construction Bid Sheet save time and money on your new custom home building project. Is Custom Building Your Own Home a Smart Idea? Building home addition takes a great deal of planning and expense. But building home additions often has many advantages over selling an existing home and buying a new one. In the articles below you can learn every thing you need to know to tackle a home addition building project. The articles contain all types of topics on all types of home additions including; family room additions, master bedroom additions, great room additions, dormer room additions, garage additions and more. By reading these articles you’ll learn all the steps to building a home addition onto a house yourself, to hiring a home addition contractor, to how to create home building plans, and to estimating home addition building costs. And much more! What Defines a Room as a Bedroom? Building a Second Story Addition onto a Ranch Home? The articles below provide help for building home additions and most importantly paying for them. The below articles talk about ways to finance a home addition building project, how to obtain a home addition building construction mortgage, and developing your own home addition budget estimates. How to Hire the Right Home Addition Building Contractor – Know what questions to Ask! 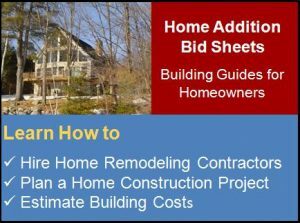 New Home Construction Bid Sheet – Planning to build your dream home and want to be your own General Contractor or looking to hire one? Do you know what questions to ask to ensure your hiring the right contractor for your project? 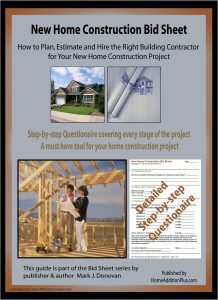 The New Home Construction Bid Sheet from HomeAdditionPlus.com provides an extensive contractor questionnaire, to help you ask the right questions to potential contractors, thus ensuring you get the home completed properly and on time and budget. In addition, it provides estimated home building costs and time intervals for each phase of the home building project, as well as extensive advice for the homeowner. Free Building Home Addition Price Quotes with No Obligation! Fill out our 3-5 minute quick and easy form, and receive a free price quote on building a home addition from one of our pre-screened and licensed home addition contractors. This process is free and there is no obligation to continue once you receive your house addition price estimate.